Timesheets Lite is a Microsoft Windows program that enables you to track your time sheet information quickly and easily and then report on that information for project tracking or billing purposes. Don't let the low price deceive you though, Timesheets Lite contains many powerful features can that save your company real time and real money. Allow employees to add, edit, and delete timesheet information using an intuitive calendar based timesheet. The Timesheets Administrator can create and track an effectively unlimited number of projects, customers, and employees. Create an unlimited number of common activities to allow finer tracking of exactly how your employees are spending their time on your projects. Timesheet data can be tracked in decimal hours, hours and minutes, or customisable time units (for example one unit could equal 6 minutes). 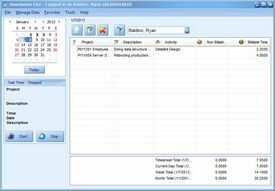 Timesheet entries can be easily moved or copied between days using a simple drag-and-drop system. 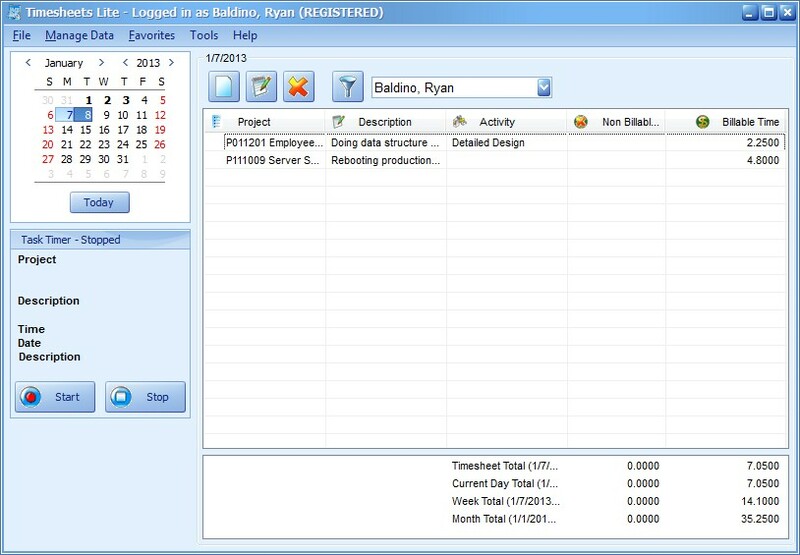 Employees can define favourite projects and timesheet entries for faster data entry. Timesheets Lite includes a simple to use but deceptively powerful reporting engine. All reports can be exported easily to a number of different formats including PDF, Excel, HTML, or CSV. There are more than 12 distinct and highly configurable reports to allow you to view and analyse your timesheet information. Reports included are suitable for generation of invoices, for preparation of employee payroll, for detailed project management and monitoring, and determining exactly who is and who is not generating billable hours for your company. Track billable employee hours against the budget quickly and easily using an easy to understand employee timesheet. Install Timesheets Lite on any computer and have your employees enter their timesheet information anywhere. In most cases Timesheets Lite doesn't need a dedicated database server as the standard software can support up to 30 timesheet computers. If you need a lot of timesheet computers, better data reliability, or perhaps a system that will operate over the internet then Timesheets Lite can use MS SQL Server or MySQL. Timesheets Lite includes dozens of confugration options to allow you to setup Timesheets Lite to suit your business. Even better employees can configure the way the software looks and functions to suit their own needs. Timesheets Lite has a completely open database allowing you to integrate it with the reporting engine of your choice (such as Crystal Reports). All Timesheets Lite reports can be exported to a number of different formats with just the simple click of a mouse.